In many ways, the Spanish Civil War (1936 – 1939), pitting fascist rebels against a democratically elected government, was a sneak preview, in proxy form, of World War II, which began a few months after the guns fell silent in Spain. The western democracies, led by Britain and France, declared neutrality and imposed an arms embargo that hamstrung the democratically elected Republican government and severely restricted its ability to defend itself. It did little to impede the fascists, who were generously supported by their natural allies, Mussolini and Hitler. Indeed, Hitler sent a German expeditionary force, the Condor Legion, which played a key role in securing victory for the Spanish fascists. In the meantime, the Republicans were forced to rely for arms on the Soviet Union, which charged them through the nose for the privilege, then abandoned them when Stalin sought to make nice with Hitler. Many of the German weapons and tactics that would play a key role in WWII were first tested and fine tuned in the Spanish conflict. So were many of the horrors, such as the terror bombing of civilians, in a deliberate bid to break their morale and will to resist. Most notorious of those horrors was the Condor Legion’s bombing and destruction of a small Basque town in northern Spain, which inspired Pablo Picasso to paint what is perhaps his most famous painting, Guernica. Spain’s generals rose up against their government in July of 1936, and soon thereafter, their leader, general Francisco Franco, sent emissaries to Hitler, requesting aid. They found him feeling bullish and brimming with confidence, as 1936 had been a good year for the Fuhrer, and the year still barely half over. That March, he had successfully stared down Britain and France, by sending German troops into the Rhineland, in blatant violation of the terms of the Treaty of Versailles, without eliciting anything but feeble protests. A few months later, the Berlin Olympics had been a huge success, burnishing the image of the Third Reich and its leader. Franco’s envoys were fortunate that the meeting took place at the annual Bayreuth Festival in honor of Hitler’s favorite composer, Wagner. The German leader was thus in a particularly good mood, and inclined to be generous when the Spanish emissaries requested help in transporting their veteran forces from Spanish Morocco to the Spanish mainland. Franco wanted 10 German transport aircraft, with air and ground crews. Hitler responded by sending him 20 Junkers Ju 52s. Three million Reichsmarks were earmarked to fund an ostensibly private joint Spanish-German enterprise, the Spanish-Moroccan Transport Company, that was set up to provide cover and conceal German involvement. Over the next few months, German pilots operating German airplanes carried out an airlift codenamed Operation Magic Fire, to fly Franco’s soldiers to Spain. Ju 52s crammed with Spanish troops would transport about 13,500 veteran soldiers, plus 36 artillery pieces and 126 machine guns, in the world’s greatest airlift until then. It finally ended in October, when the fascists won control of the sea lanes between North Africa and Spain, enabling them to transport troops and equipment more economically in ships. Spanish infantry being trained by the Condor Legion. Bundesarchiv Bild. 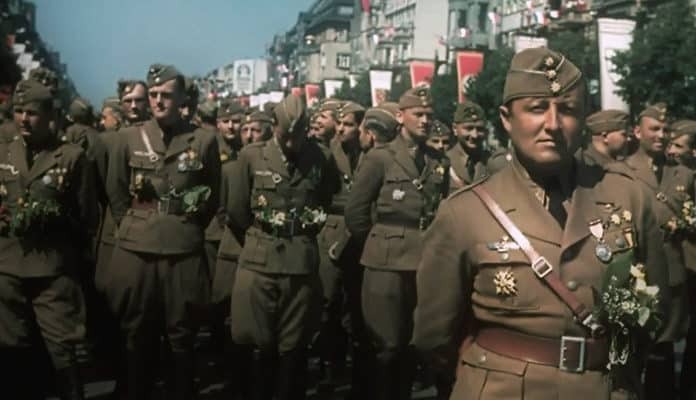 In the meantime, the Germans were busy recruiting and organizing volunteers to help Franco, and on August 1, 1936, a first contingent of 86 men, accompanied with six fighter aircraft, antiaircraft guns, and about 100 tons of supplies, was sent to Spain. It was the nucleus of what would become the Condor Legion. A month later, they were reinforced with 40 tanks, plus bombs for the steadily growing German air force in Spain: by October, Germany had dispatched about 120 airplanes to the conflict. The German expeditionary force was initially intended as a training and supply mission, but its role soon evolved from training and supply to overt combat. After the Third Reich officially recognized Franco’s rebels, German efforts in Spain were expanded and reorganized, and their forces were formed into a new unit that was briefly called the Iron Rations, then the Iron Legion, before Hermann Goering renamed it the Condor Legion.